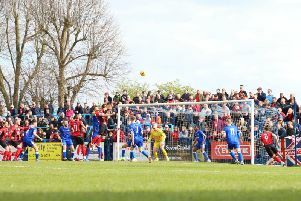 Honours ended even in the big game at Latimer Park as play-off rivals Kettering Town and Leamington shared a 1-1 draw in the Evo-Stik Southern League Premier Division. Leamington started the better but Kettering took the lead with their first real attack. Rene Howe played in Liam Canavan whose first shot was well saved by Tony Breeden. The goalkeeper recovered to save the follow-up but Canavan reacted the quickest on the third occasion to force the ball home. But the visitors drew level just before half-time when former Poppy Courtney Baker-Richardson was brought down by Chris Carruthers. The referee awarded a penalty despite protests that it was outside the box but Sam Austin stepped up to confident score from 12 yards. Breeden saved well from James Brighton and Canavan after the break and Wilson Carvalho blasted over late on as the hosts chased a winner. But they could find no way through as the points were shared, although Kettering were able to extend their unbeaten run to 11 matches. AFC Rushden & Diamonds strengthened their grip on an Evo-Stik Southern League Division One Central play-off place with a comfortable 4-0 win over Barton Rovers at the Dog & Duck. Andy Peaks handed a debut to striker Jack Bowen, who had been signed on a dual registration from Cogenhoe United, as he replaced the injured Elliot Sandy. Diamonds took control with two goals in the space of six minutes. Claudiu Hoban opened the scoring on 23 minutes with a low shot into the bottom corner and then, soon after, Jon Stevenson doubled the advantage when his effort was fumbled over the line by the visiting goalkeeper. And the game was over just before the break when Andy Hall’s corner was headed towards goal by Lewis Leslie and the ball was touched home by Jason Lee. It was 4-0 on 57 minutes as Bowen grabbed a deserved goal to mark his debut as his low shot found the net after good work from Hoban. And that goal completed the scoring for Peaks’ side.